NEWPORT BEACH — The Army Corps of Engineers, Los Angeles District is working on a dredging project that will remove sediment along the channels in the Santa Ana River Marsh and pipe good-quality sand to a local beach. Intended to restore design channel depths, the project will remove accumulated sand and improve circulation and tidal flushing. Both are required to maintain the 92-acre salt marsh habitat, which is home to a variety of waterfowl and other wildlife. The project is scheduled to be completed by the end of this month. Sand pumping began the week of Feb. 11. By the time the $4 million project is finished, approximately 70,000 cubic yards of sand will have been removed from the marsh. 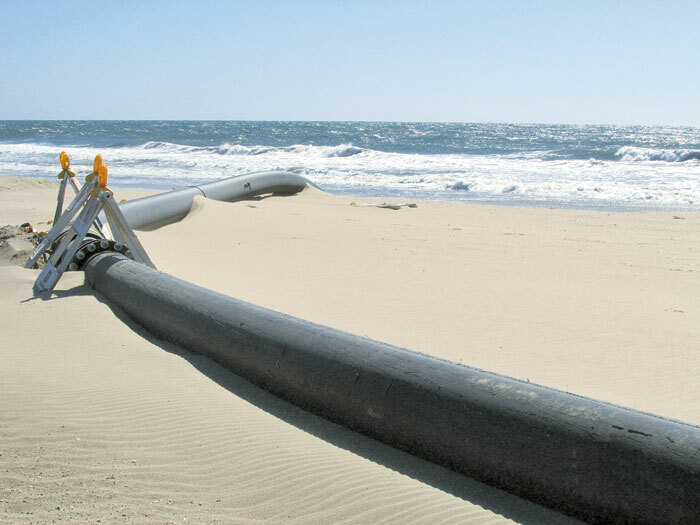 At press time, approximately 20,000 cubic yards of “clean sand” were being pumped through a temporary pipeline from the Santa Ana Marsh parallel to the Santa Ana River, then down along the beach and through the surf zone to a site located 1,000 feet offshore from 60th Street, reported Robert Stein, Newport Beach assistant city engineer. The sand was tested and approved for use on local beaches, according to a project update. The other 50,000 cubic yards of sediment removed that were deemed unsuitable for beach replacement were disposed of at an approved upland disposal site.